“This is Manchester, we do things differently here”, once said Tony Wilson – record label owner and man behind some of the city’s most successful bands during Manchester’s music heyday. 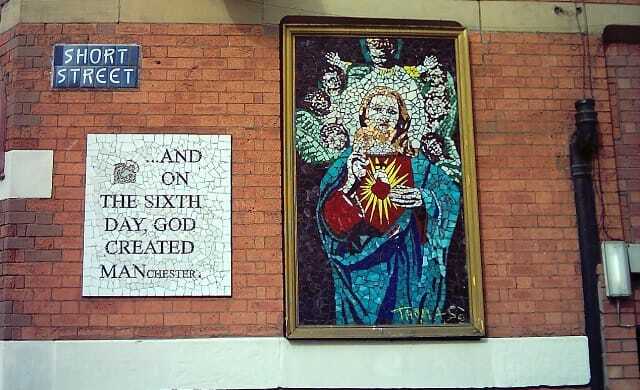 While actually not the most popular Mancunian during his lifetime, this famous quote now adorns a whole manner of pubs, clubs, shops and working spaces – and has come to have added meaning in recent times. A city divided by football, united in tragedy and powered by industry, Manchester has been at the forefront of innovation for the best part of 250 years – and shows no signs of stopping anytime soon. The birthplace of the industrial revolution and home to the first stored computer programme, Manchester’s creative Northern soul has endured through thick and thin – and has been reinvigorated through the city’s formidable tech sector. A genuine hive of start-up activity (see our guide on why you should start a business in Manchester), the symbol of the worker bee, which long represented its world-famous textile sector, has also experienced renewed usage as a badge of the city’s unity, defiance and continued entrepreneurial drive. So, we know why you should start up in Manchester, but beyond all the cultural and historical hype, what is it really like to start a business there today? What workspaces can entrepreneurs start their business in? What unique services do they offer and which sectors do they suit? And, who are the most exciting emerging start-ups in the city? As Ian Brown, lead singer of The Stone Roses and one of city’s most adored sons, once put: “It’s not where you’re from, it’s where you’re at” and at Manchester’s core is a sense of togetherness combined with an underdog spirit that has seen the city historically punch above its weight in a whole manner of industries. Not solely reserved for techies or suits, the entry level to starting your own business in Manchester is virtually non-existent, particularly in the area’s Northern Quarter which has been dubbed, by some, the ‘Shoreditch of the North’. Based in the Northern Quarter, pay-per-minute co-working space Ziferblat, which models itself on a sitting room, is definitely proud to be part of the more alternative area of Manchester. “It’s nice that something as independently-minded as the Northern Quarter takes up such a large portion of the city.” says Ben Davies, head of marketing at Ziferblat. Located on Edge Street, Ziferblat Manchester is open weekdays 8am-10pm and 10am-10pm at weekends. Charging entrepreneurs 8p a minute, there’s no requirement to sign up or even provide any details – with visitors allowed to start working on their business idea straight away. All food, teas, coffees and Wi-Fi are also included in this price which is capped at four hours or £19.20 per day. A £149 per person monthly membership is also available as well as a £125 a month membership per person for a start-up of four or more people. The monthly rates give business owners access to printing facilities, storage options and 20% off all meeting rooms. “There’s zero barriers to entry. We cater literally for everybody from mother and baby through to a business which is turning over a decent revenue but doesn’t yet have an office. We have everyone in between. We like to think of ourselves as something for everybody. What makes Ziferblat stand out? Fully accommodating to mumpreneurs, Ziferblat Manchester recently signed up to the Breastfeeding-Friendly Manchester scheme – allowing new mothers to breastfeed their baby on the spot without fear of reproach – and regularly holds a ‘Mums in business’ networking group. Not just a space for resident start-ups to ‘sound off’ against or supply each other services (a tenant called Bamboo is currently redesigning their website), the space also invites external groups and speakers to provide insight and advice to its members. The likes of the Guardian, TED and the Business Growth Hub have all held workshops and talks in Ziferblat, while Freelance Folk, a freelance community group, hold an event every Friday where they offer advice on raising finance and connect businesses who may be able to offer each other their services. “It’s quite difficult being a start-up, often funds are tight, you’re on your own and with a lot of co-working spaces there is that entry point. There’s no entry point with us.” says Harold. More an environment for fledging start-ups than established small businesses, Harold acknowledges that businesses who scale fast will soon outgrow Ziferblat. “There are kind of only two rules here really, one is respect everyone else and the other one is clean up after yourself. So that kind of creates a nice relaxed atmosphere.” says Mark Butler, one of its directors, who knows all too well of the diversity of his fellow tenants. “It varies quite a lot from day to day, that’s kind of what we like about it. The closest thing I can equate it to is a hotel lobby – there’s always different kinds of people coming and going. “You are right in the heart of it. You are surrounded by potential customers, potential suppliers, there is just so much going on all of the time. There’s always a new bar or new restaurant open. When the BBC decided to uproot several of its production strands and move them from London to Manchester in 2003, the decision turned many heads – but also helped turn the wheels of change and innovation. 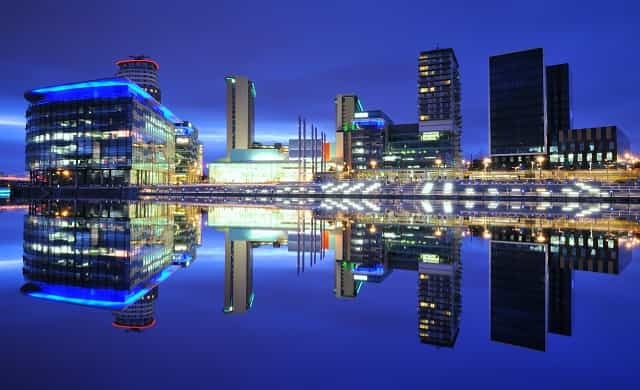 Based in what once was the banks of Manchester Ship Canal, MediaCity is perhaps the shining light of the city’s digital and creative scene, with the waterside development now home to the likes of the BBC, ITV and the University of Salford. Once upon a time referred to as Cottonopolis, up until the latter stages of the nineteenth century 32% of all global cotton production still took place in Manchester, and while its world-famous textile industry lives on only through Underworld in Weatherfield, its ‘tech-stiles’ sector ensures the tradition remains. Today, MediaCity is home to a vast array of clubs, hubs and workspaces including two co-working and production spaces that work in tandem to compliment Manchester’s emerging position as a broadcasting powerhouse, with its history and renewed passion for more ‘hands on’ production. Truly the heirs of ‘warehouse city’, today, product-based tech businesses and emerging digital media start-ups alike head to The Landing and Barclays Eagle Lab. Standing tall among some of the world’s biggest media companies is The Landing – which opened in 2012. The resident tech hub for Manchester scale-ups, over 116 start-ups currently inhabit the seven-story building in MediaCity, Salford. Offering co-working and office space to entrepreneurs working in a range of tech sectors such as digital media, VR, AI, digital health and IoT, it’s The Landing’s impressive user testing facilities and strong partnerships that allow resident businesses to finetune their ideas and scale fast. Currently, around 20 professional advisers are on-hand to share their expert knowledge to Landing-based businesses and come from a range of commercial and corporate firms. Services include legal expertise, investment and banking support, business planning, recruitment guidance and advice on tech and infrastructure. Build (12 months): For £1,999, start-ups get 24/7 access as well as the “Prove package” (incubator, specialist, lab use) plus ongoing bespoke and 1-2-1 support as required. Prove (six months): For £999, start-ups get 24/7 access as well as the “Test package” incubator programme plus further specialist workshops and complimentary use of the UX Labs and Eagle Labs for up to one day each. Test (three months): For £499, start-ups get 24/7 access and a specially curated incubator programme to “health check” scaling. Monthly Unlimited: For £199, start-ups get 24/7 access plus incubator, specialist support, lab use, and ongoing bespoke and 1-2-1 support as required. An additional benefit to The Landing is its interactive media and user experience (UX) labs, SPACE, based on the sixth floor. The pay-as-you-go service allows tech start-ups, at almost any stage, to test products they’ve built or games they’re about to launch. SPACE labs are available from £500 per day. Not just offering a place for businesses to work hard, The Landing’s membership club on the seventh floor (eponymously titled On The 7th), provides start-ups with a place to eat, drink, relax and network to their heart’s content. With a modern, upmarket feel and overlooking the rest of MediaCity, On The 7th also provides businesses an impressive venue in where they can invite clients too – and proudly call it home. “Over the last five years The Landing has been developing a ‘plug and play’ business ecosystem designed to give tech scale-up and start-ups a platform to grow rapidly. The whole building is about connectivity, between both people and technology. What makes The Landing stand out? Having access to SPACE is one of The Landing’s key highlights – serving around 1,000 entrepreneurs annually. Helping brands understand user experience, the UX labs can be dressed up and re-designed like a real-life living room, complete with a one-way mirror, to gauge an as-authentic-as-possible reaction from a potential consumer – while test subjects can also be given a special headset to track eye movement while using apps or browsing websites. SPACE’s 10-seater dedicated games console laboratory also helps gaming start-ups sample their games, whether it’s to test it on certain demographics for their response or to find flaws in the game before it’s released to the general public. What’s more, its digital workflow labs allow businesses who work in the broadcast industry and in software development to invite products teams to test workflow and software. Screening rooms, essentially a small cinema, are also on-hand for production start-ups who want to watch rough drafts and edits of their videos. A sign of the fast connectivity on offer, The Landing’s file sharing capabilities mean start-ups can watch their work on the big screen – regardless of where they create it. Who is The Landing for? A dedicated technology incubator hub for high-growth technology and digital start-ups, scale-ups and small businesses, The Landing is best suited to innovative tech start-ups looking to disrupt their chosen sectors and challenge the corporate giants within those industries. Admitting it was pining for an “office with a view” for years, specialist tech providers HEInventions moved to The Landing in February 2017. Founded by Dr. Carl Ellis and Dr. John Hardy in June 2013, HEInventions’s flagship product, sold through the Swiss company BOBST, is a digital inspection table that is used by packaging manufacturers to check their product is printed correctly. Receiving an InnovateUK grant early on in its start-up journey, The Landing-based business has already been recognised within its industry – winning an innovation award from EFIA (a printed packaging association). “The gravitas of the address lets us punch above our weight in terms of our customers and partners. Situated on The Landing’s fourth floor, Barclays Eagle Labs is The Landing’s hi-tech fabrication studio and maker workshop – and the first of its kind in the North of England. Helping businesses grow through rapid prototyping capabilities and business support from Barclays, both residents of The Landing and external businesses can use Barclays Eagle Labs. A real modern-day maker’s workshop, Barclays Eagle Labs ensures entrepreneurs with a penchant for working with their hands are by no means left behind in the 20th century. 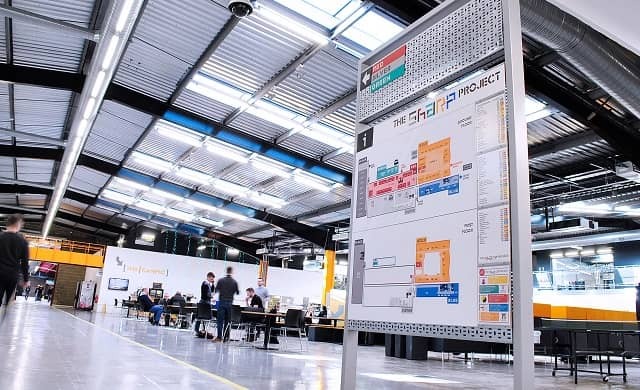 “There’s no other place in Greater Manchester like the Eagle Lab where you can design and build a product prototype, print off a short-run of bespoke components, or mould a one-off widget for a specific purpose. What makes Barclays Eagle Labs stand out? Its two special 3D printers can produce large scale objects and highly detailed models in both curable plastics and composite powder format. A sure sign of the manufacturing strength on offer, one has even been calibrated to ‘print’ copies of body parts from hospital CT scans that can allow surgeons to study fractures in 3D before picking up a scalpel. Who is Barclays Eagle Labs for? Developed to help local businesses and entrepreneurs take ideas for new physical products, gadgets and devices and turn them into working prototypes and proven concepts via rapid prototyping, the labs are equipped with advanced 3D printers, lasers cutters and more traditional handheld tools. Stockport-based BaDoom, who produce edtech devices for children with severe learning difficulties, used the Lab’s 3D printing machine to repeatedly recreate and refine intricate and bespoke pieces – a process that otherwise would have had to be done by hand. For HEInventions, its the help and practical advice on offer, as well as the arsenal of tools, that makes Barclays Eagle Labs stand out. Originally having their light bulb moment after a two day start-up bootcamp at Lancaster University, what do HEInventions think of Manchester as a start-up city? “It’s growing, more every month. It feels that the past few years Manchester’s start-up network has been finding its feet and has settled down into its own rhythm. “It’s a different city than London and I think initially it tried to emulate the capital too much – but we have less-people, a more-family orientated outlook, and a lot of us commute. Sponsoring Manchester United for nearly 20 years, including their famous treble winning season in 1999, Japanese electronics multinational Sharp became one of the most recognised brands in the UK and wider world. Inescapably synonymous with both Manchester and technology, Sharp said goodbye to the city in 2006 – selling its Newton Heath warehouse to Manchester City Council for £6.1m. In typical Mancunian fashion, the gaping hole left by Sharp’s departure was filled by looking to the future – with one eye firmly on the city’s past. As, in 2011, The Sharp Project was officially launched to house some of the city’s most innovative digital entrepreneurs – rather than a foreign, faceless multinational. A 200,000 sq ft building based on Thorp Road, The Sharp Project is home to over 60 digital start-ups who are housed across over 70 converted shipping container glazed offices in its Red, Gold and Blue zones. Resident start-ups at The Sharp Project pay £60 plus VAT for a single shipping container and £100 plus VAT for a double – with connectivity and electricity extra. A day rate is also available for entrepreneurs who just want access to The Campus. Two networking and event spaces, The Campus and Winter Garden, are the main focal points of the building and can accommodate up to 1,000 people in total for a variety of internal and external events such as large-scale launches, conferences and film screenings. Situated in the Gold area, The Campus is a 5,000 sq ft communal social space with an onsite restaurant, which is run by a tenant. While The Winter Garden is a self-contained five metre high 4,780 sq ft annex to the main building and is used for workshops, auditions and exhibitions. Despite the building’s industrial interior, there’s certainly a community feel among its businesses. So much so, that over £21m worth of business has been passed between Sharp Project tenants since the site’s inception. With monthly events held for tenants and the general public alike, on everything from R&D tax credits to table tennis tournaments, the Sharp Projects positive and inclusive atmosphere ensures businesses have no trouble getting to know their fellow tenants. What makes The Sharp Project stand out? Central to The Sharp Project is its impressive TV and film production space which includes four production stages and a green screen for businesses looking to create content both for the small and silver screen. Designed to meet the needs of even the smallest production company, the production studios have 24/7 access and can be hired in conjunction with related back stage facilities – including dressing rooms, make up, wardrobes and catering on request. Prices for the production space start at £500 plus VAT per day, while on-site tech and production support is also available. Rather than relying on portable greenscreens, start-ups based at The Sharp Project can make use of its four purpose built green studios. Ranging in size, the studios are available to hire for voice-overs, photography, advertising and the creation of digital content. Testament to the production services on offer at The Sharp Project, global giants Nike have no looked no further than Newton Heath to film some of its commercials – while television series Fresh Meat and Casualty 1909, which aired on Channel 4 and BBC One respectively were both shot there. Who is The Sharp Project for? With a focus on digital businesses, Hinds summarises what The Sharp Project means by ‘digital’. “A digital business could be anything from a photographer to a PR company, to a forensic business to a gaming start-up. Anything that focuses on the creation of digital content. With tenants required to stay for at least 12 months, and given the resources on offer, start-ups in the Sharp Project can grow quite quickly – and Hinds is reminded of a recent start-up who scaled so much, they soon outgrew their surroundings. “A success story for us would be a business coming in small and growing to a point where we can’t fit them anymore. An example of this would be a company called Northcoders – they’re a coding bootcamp. Moving to The Sharp Project back 2010 as a brand new agency, ABF Pictures specialises in the production of commercials- and have filmed for the likes of MandM Direct, Virgin Bingo and Hello Fresh. “As a creative agency who create TV adverts we do a lot of work off on a location somewhere, but there are some areas where we need to film with a green screen and that’s where the space at The Sharp Project is so handy! “We recently finished an ad with Peacocks, which was filmed at Delamere manor and had a couple of scenes filmed at The Sharp Project. Designed and built only in the 2000s, Spinningfields was created specifically to give Manchester’s its own dedicated central business district. Still reeling from the Provisional IRA bomb that had caused £700m worth of damage a year previously, its proposal originated in 1997 when Allied London purchased a number of buildings around the John Rylands Library. 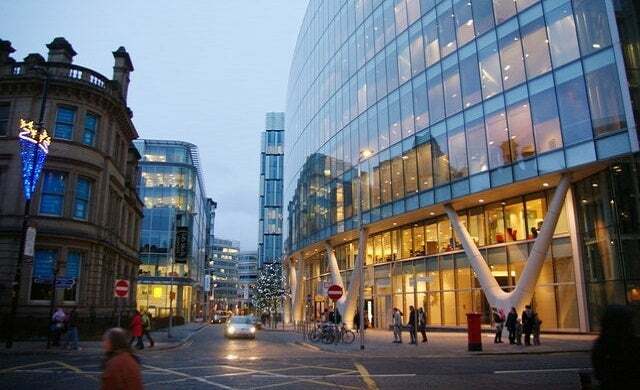 The world’s largest free business accelerator, Entrepreneurial Spark’s Manchester branch is situated in Spinningfields, on the first floor of RBS bank – though it is officially sponsored by NatWest. Working with entrepreneur development managers from NatWest, RBS, as well as Ulster Bank, Entrepreneurial Spark helps start-ups utilise their local ecosystems to help make their business more credible, backable and investable. They have also partnerships with the likes of KPMG Enterprise, Dell Technologies, Harper Macleod and Pinsent Masons. Offering four different phases of its programme, Sprint, Enable, Grow and Scale, inhabitant start-ups can receive up to 18 months’ worth of fully-funded training and mentoring. Admitting that tenants “never experience the same day twice” entrepreneur manager Libbie Mowbray is quick to point out that E Spark accelerators are as much a “people accelerator” as anything else. A fast-paced environment combined with the array of workshops and cross-collaboration between resident start-ups, businesses are continuously striving to meet ambitious goals in order to scale quickly. With goal setting an imperative part of the E Spark process, businesses are often taught to focus on three targets per month and to make each other accountable for their actions – ensuring a competitive yet collaborative environment. With all residents based on the same, open-plan floor, all computer desks circle a series of glass door meeting rooms where start-ups regularly meet with the hands-on enablers who keep a firm yet attentive eye on tenants – ensuring they’re reaching the levels of growth expected of them. What makes Entrepreneurial Spark stand out? Placing a super strong emphasis on the power of pitching, E Spark enablers routinely ask start-ups to repeat and refine their elevator pitch – with all start-ups required to deliver an demand 60 second pitch of their business idea to new visitors. An indispensable skill to possess when meeting investors, potential partners and other businesses, entrepreneurs are equally well-trained to know their real time financial data at all times, so that they’re ready for any potential situation. Who is Entrepreneurial Spark for? Sprint (three months): For entrepreneurs with just an idea or in the early stages of starting their business, the Sprint phases helps start-ups develop and validate their idea – with a view to developing it further. Or if the idea doesn’t work – they fail cheap but fast. Enable (six months): For entrepreneurs who have successful passed through the Sprint stage, Enable lasts six months and offers more “hands-on” mentoring to aid continued acceleration – as well as helping further develop of the mindset of the business owner. Grow (six months): For businesses already turning over £100,000, or having raised more than £25,000, the Growth stage aims to put in place all the requirements needed to allow the start-up to scale quickly. Scale (six months): Designed for businesses on a scale trajectory with an annual turnover of £200,000 or investment of £150,000 or more, the end goal is for the business to be fully equipped to scale fast. Start-ups that want to gain a place on the Entrepreneurial Spark need to complete an online application form outlining their business idea, progress to date and plans for the future. Having launched in December 2016, engagement photography start-up Captured Proposals has been in E Spark for the past nine months and entered through the ‘Sprint’ phase of the programme before progressing to ‘Enable’. Utilising its network of over 200 former paparazzi photographers, the start-up helps clients secretly and discreetly capture the moment they offer their hand in marriage to a loving partner – and have successfully snapped wedding proposals all over the world, from San Francisco to Santorini, London to Paris. Having partnered with a host of major brands including the Coca Cola London Eye, Tower Bridge and jewellers David M Robinson – the start-up has also teamed up with some of the world’s leading venues, bridal shops and wedding planners to help clients get on one knee before heading down the aisle. “I’ve learned in incredible amount. Going in-front of investors is one of the key components to supporting our business growth. Continuing to help hopeless romantics around the world, does Illidge have a soft spot for Manchester as a start-up city? “Manchester is a wonderful city to start and develop a business, where we have a booming start-up and tech scene. “We’re fortunate to have access to businesses of all types and sizes, which is imperative for an entrepreneur, whether it’s accountants; lawyers, digital agencies, investors or collaborators, we have it all. “The people of Manchester really make our city what it is. We’re a friendly bunch, and always looking to help each other. That’s the feeling you get throughout our accelerators, events and businesses. “With a such a diverse range of start-ups there’s almost a one degree of separation. 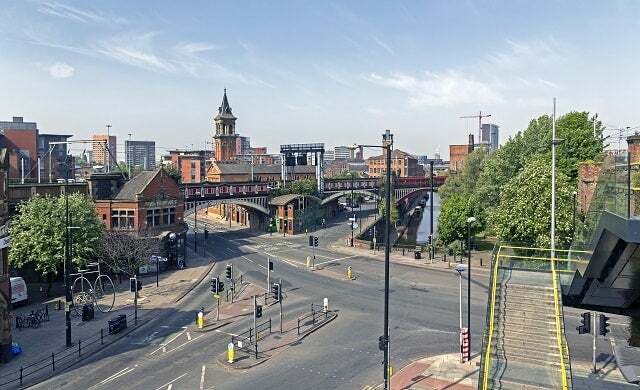 Once described by singer Morrissey as a “docklands without the docks”, recent inward investment, coupled with its innate creativity, has seen Manchester truly become a start-up city of the 21st century – no matter what area you visit. However, with over 9,000 businesses starting in 2016 alone, in truth, Startups’ one man mission to Manchester barely scratched the surface. So, we want to know, what have we missed? Are you a Manchester-based co-work or accelerator housing some amazing start-ups worth shouting about? Are you a maker’s lab producing some innovative products ready to blow some stale sector wide open? Or, are you a new entrepreneur who believes you’re at the beginning of your journey to becoming the next UK unicorn? Inspired by our trip to Manchester, Startups is already planning for our nationwide tour in 2018 – and we want to hear from you. Reckon your city or town’s start-up scene is worth writing about? Is it a hidden diamond in the regional roughs? Tweet us with your tips @startupstowers or email Shane Donnelly: shaned@startups.co.uk.